Connect USB Type-C enabled devices like a MacBook, Chromebook Pixel, Galaxy Note 7 and more to other USB Type-C devices and accessories such as a smartphone, car/wall charger or multi-port adapter. Amazon is selling AmazonBasics USB 3.1 type C to Type C Gen1 Cable -3Feet -White at Rs 299. 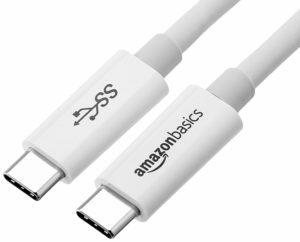 How to buy AmazonBasics USB 3.1 type C to Type C Gen1 Cable -3Feet -White at Rs 299?